La metropolitana di Tokyo è famosa per molti motivi primo tra tutti l’efficenza. In più è estremamente puntuale e pulita e per i giapponesi è un vero vanto poterci lavorare. La metropolitana è anche famosa per essere in grado di coprire l’intera area della città per cui è consuetudine vedere i passeggeri dormire durante i lunghi tratti. 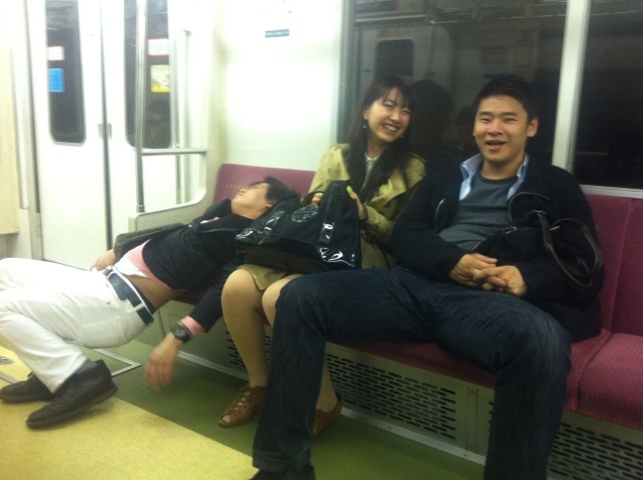 Tokyo subway is famous for many reasons and the first one is first the efficiency. In addition it is always in time and clean and for the Japanese people is proud to work for. The subway is also famous for being able to cover the entire area of the city and for this reason it’s easy to see passengers sleep during the long rides. In the photo a passenger more tired of the other has a rest! This entry was posted in Foto, Fotografia, Giappone, Japan, Photo, Photography, TRavel, Viaggi and tagged Giappone, Japan, Metropolitana, Photo, Photography, Subway, Tokyo, Travel, Viaggi. Bookmark the permalink. Anch’io ho assistito a scene simili, solo che io e miei amici ridevamo come dei cretini, mentre gli altri giapponesi rimanevano imperterriti. Guarda questo post! Penso che questo blog ti possa interessare. Io lo trovo molto bello.